Virginia Beach, VA – May 19, 2015 – In partnership with the American Music festival, Sheryl Crow will headline the post-race concert at the Humana Rock ‘n’ Roll Virginia Beach Half Marathon on Sunday, September 6. Crow will perform at the main stage that evening for 20,000 runners and thousands of spectators at the Virginia Beach stop of the Toyota Rock ‘n’ Roll Concert Series. One of the most popular names in music, Crow has won nine Grammy Awards and has sold more than 50 million albums worldwide. Crow has released eight studio albums and is known for a variety of hits including, “All I Wanna Do,” “If It Makes You Happy,” “The First Cut is the Deepest” and “Soak Up the Sun.” In 2012, she ran the half-marathon at the St. Jude Country Music Marathon, a Rock ‘n’ Roll Marathon Series event. 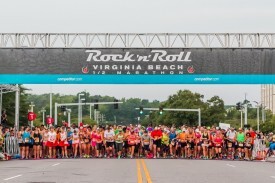 Humana Rock ‘n’ Roll Virginia Beach will once again feature two-days of running with the Mile on the Sand taking place on Saturday, September 5 on 19th Street. Participants who run the Mile on the Sand on Saturday and the half marathon or 5K on Sunday will earn the coveted Remix Challenge medal in addition to each distance’s finisher medal. The half-marathon and 5K will start adjacent to the Virginia Beach Convention Center and will run through the resort area, Camp Pendleton, and finish north on the boardwalk. Local bands will play through the streets of Virginia Beach, along with spectators and cheerleaders lining the route to motivate runners to the finish line. After the race, participants can relax at the finish line festival at 17th Street and then head to the 5th Street stage later that evening for the headliner concert featuring Sheryl Crow. Each half marathon participant will also receive free entry into the three-day American Music Festival by presenting their race bib and 5K runners will receive entry to Sunday night’s concert. Race weekend kicks off with a free Health & Fitness Expo, where runners can find numerous interactive clinics with running experts, elite athletes, vendors and much more. The Expo takes place at the Virginia Beach Convention Center on Friday, September 4 from 1 p.m. to 7 p.m. and Saturday, September 5 from 10 a.m. to 5 p.m. The Expo is free and open to the public. The 2015 Humana Rock ‘n’ Roll Virginia Beach Half Marathon, 5K and Mile on the Sand will take place the weekend of Friday, September 4 – Sunday, September 6. The half-marathon will give runners a first class tour of Virginia Beach starting at the Virginia Beach Convention Center and finishing at the Virginia Beach Boardwalk. Runners can rock to the sounds of live, local bands along with enthusiastic cheerleaders to keep participants moving. The event concludes with a finish line festival and Sunday night concert with headliner Sheryl Crow in partnership with the American Music Festival. A two-day Health & Fitness Expo kicks off race weekend at the Virginia Beach Convention Center on Friday, September 4 and Saturday, September 5. The Expo will have numerous vendors featuring the latest in running gear, nutrition and training tips. To register for the race or for more information visit runrocknroll.com/virginia-beach or follow us on Twitter @RunRocknRoll.